In Real Life, Heaven’s Dream Town! In Real Life follows the decisions made by Anda, a teenager in Flagstaff, Arizona, as she tumbles through life both online and off, navigating the gray economics of earning real-world money for in-game actions. Written for a YA audience, the scripting is clear and naturalistic. The plot, which finds Anda trying to help a Chinese gold farmer who works long hours playing online games, is almost preachy. However, a few more subtle developments save it: Anda inadvertently causes Raymond, the gold farmer, to lose his job; she’s called out for trying to dictate morals to a culture that isn’t her own; and Raymond ends up fixing his own life without help from a white savior. It’s an effective story that doesn’t let a moral lesson get in the way of honest character interaction. 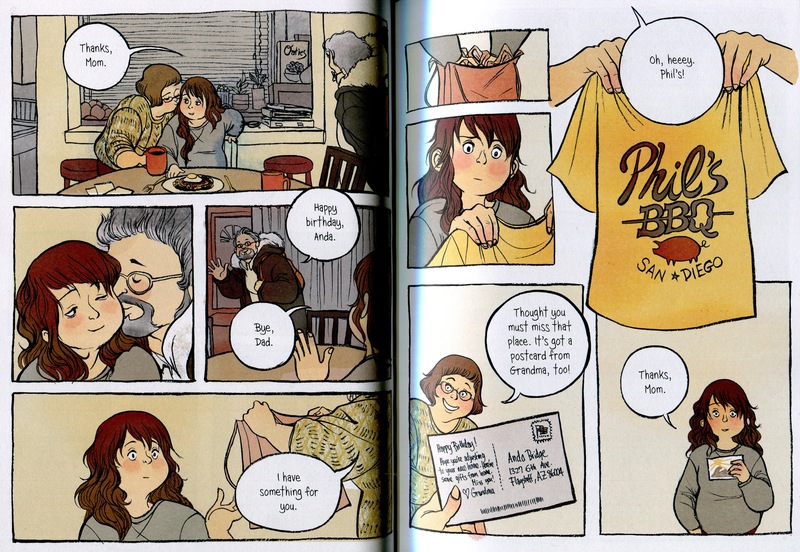 The true treat of In Real Life is Jen Wang’s art. Her character designs are varied and realistic, and each one has a separate and believable posture and style. Their body language and facial expressions have a beautiful rhythm that propels the characters through situations without any need for written dialogue. The quiet, real-life moments are punctuated by Wang’s madcap descent into the world of Coarsegold, the fictional online game that Anda plays. Her action sequences are fluid, and her use of in-game interfaces (health bars, inventory menus, log-off icons) works as an almost musical counterpoint to the more representational visuals, adding tension or slowing things down as needed. 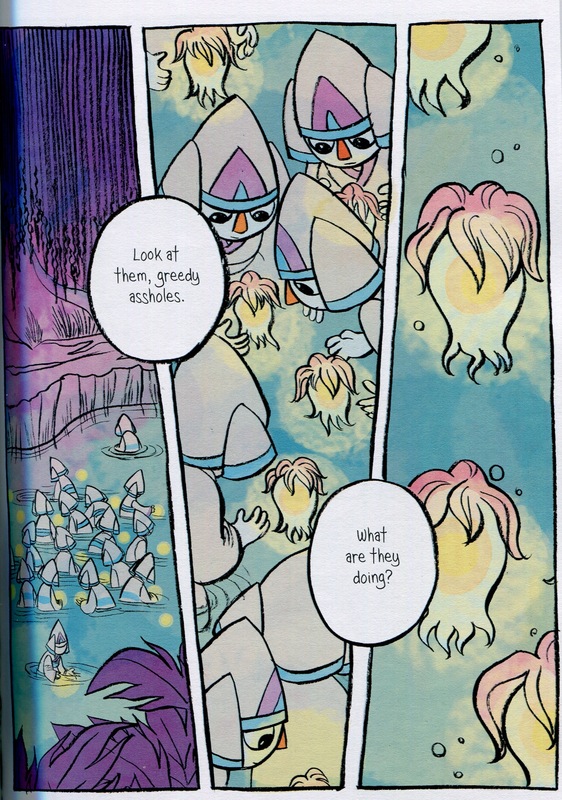 And the colors in this book are just fantastic! Anda’s everyday life is filled with browns and yellows, while the game world is vibrant and bright. The tension between the bland and the vivid illustrates why Anda might be more drawn to the online world than her school and family life, and when she dies her hair a bright red, it’s a symbol of how her confidence in Coarsegold is bleeding into the passions she’s discovering as an organizer and activist. 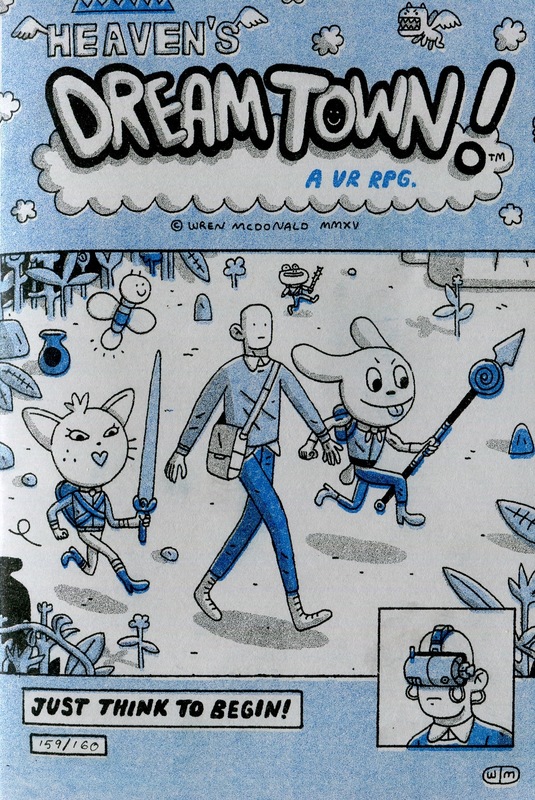 Where IRL is long, full color, and clearly moral, Heaven’s Dream Town!is short, monochromatic, and much fuzzier. It follows an unnamed protagonist as he alternates his factory life with trips into an online VR world. 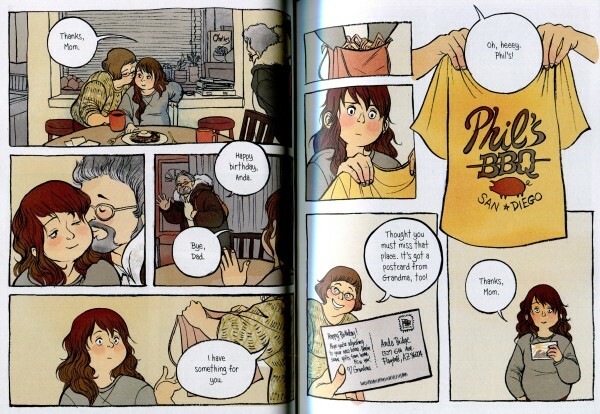 Throughout the book, the protagonist is confronted with three moral decisions. 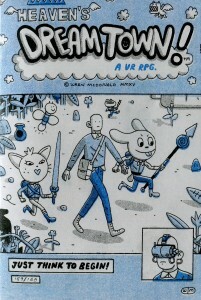 First, in Heaven’s Dream Town, a new player asks him for help but actually tricks him into losing all of his inventory. Next, the factory he works in catches fire, and he attempts to save a fellow worker. On failing due to an explosion, he runs to safety. 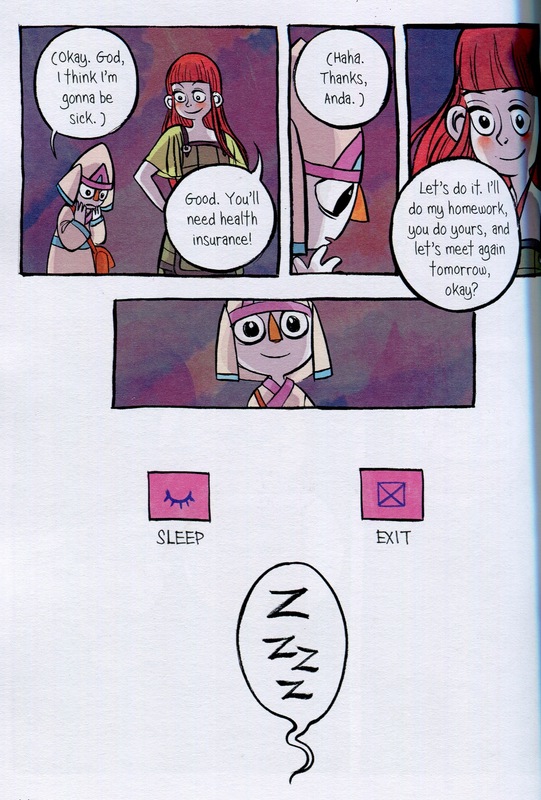 Finally, another player helps to win back his inventory, but she’s killed while the protagonist’s avatar stands silently, the final page showing that he’s fallen asleep in real life. It’s a much more pessimistic view of life than what is presented in IRL: those that try to do good are fleeced, fail, or get too tired. But it’s not as bad as it seems—at least he tried, and with no incentive for himself. So if we can’t be Anda, at least we can be a nameless protagonist. McDonald’s page structures are smart and clear. Real life and online life never “live” on the same pages. 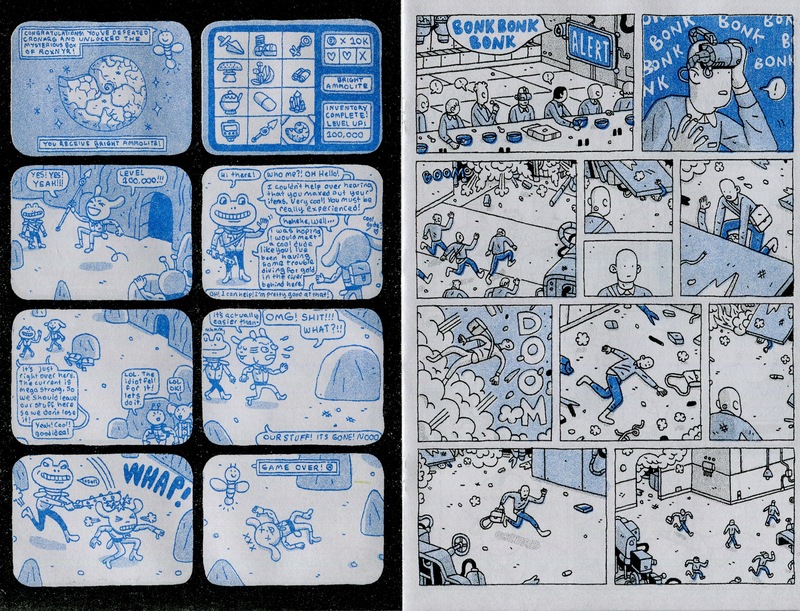 The pages taking place in Heaven’s Dream Town have black gutters and rounded, square panels reminiscent of screens (where each panel could be a screenshot), while the pages of his everyday life have hectic panel placement with repeated imagery. The game mechanics of Heaven’s Dream Town as represented on the page feel less “true” than the similar elements in In Real Life. Characters’ levels are based on their inventory, so when the protagonist loses all his items, he’s bumped back to a beginner’s power. In most games, a character’s level and power is based on how long they’ve played, and it’s generally not possible to lose those levels. McDonald’s imagined system is subtly capitalistic, and it’s much scarier than traditional scaling. The one with the most toys literally wins, but those toys can be taken away. It’s just one more way that Heaven’s Dream Town! shows a world that is painfully like ours, while In Real Life, with its closure and personal power and self-evident power, might represent the world we’d like to see.